Aaron was busy talking to a friend at Wegmans and left me unattended for too long. As a result I wandered off and found a chocolate bar with bacon in it. 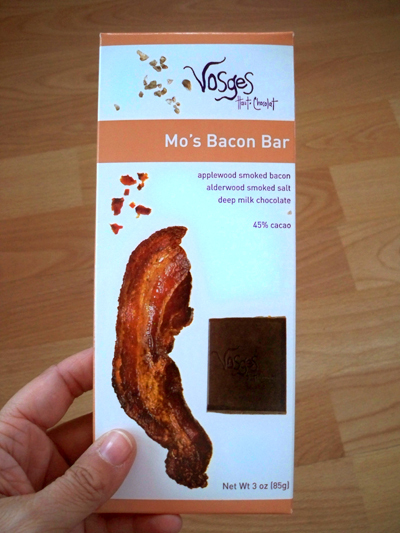 I have been curious about chocolate covered bacon for awhile, so when I saw a conveniently packaged, ready to go Vosges Mo's Bacon Bar, I couldn't resist. It was tasty... salty and sweet. The bacon bits are quite small though, my appetite has been whet and now I want a true strip of chocolate bacon. Two thoughts - #1 Who is Mo? #2 How long did it take them to find the ideal strip of bacon to feature on the packaging? I like salty & sweet foods so I will have to give this a try. Have you ever had bacon mixed into waffle batter? Next time you're in San Fran, try to visit Stacks for it's waffle bacon. Yum-yum. I have to tell my boss about this. He thinks bacon is a food group. Here in Portland we have a company called Xocolatyl de David that makes bacon truffles. Must be a trend. "mo" is the incomparable mo frechette of zingerman's! I actually found a recipe awhile ago and made chocolate bacon with a toffee topping. While it tasted good, the refrigeration changed the texture of the bacon and i didnt like it...my two teen boys DESTROYED the tray of it though! I reviewed Mo's Bacon Bar on my blog last summer (I think). Om nom nom. I've noticed that my Whole Foods now sells a teeny size version at their checkouts. They know my weaknesses. This is one of my Go To Gifts. Personally I like the dark chocolate one to the milk. Everyone I give it to thinks it is cool. This past xmas the teachers were all scared to try it first until a teacher from last year told them it was good. Ha!